This truly delightful collection of poetry is one to be treasured & pored over again & again. Presented in its beautiful slip case with a unique glow-in-the-dark cover, this would make a divine gift adults and children alike. Folio are renowned for delivering quality products and this is no exception. 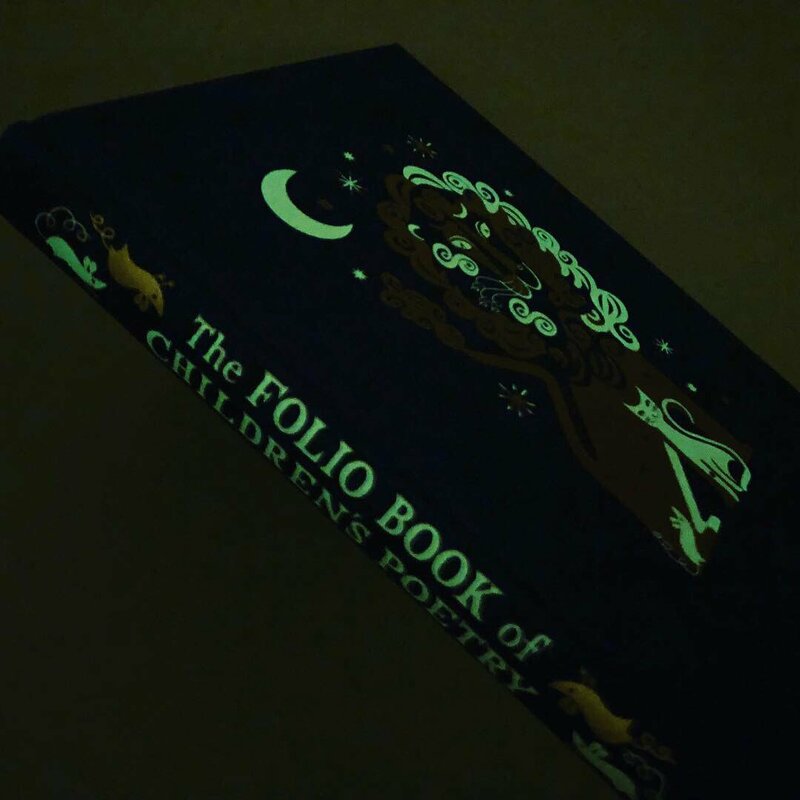 ‘The Folio Book of Children’s Poetry‘ is a thoughtful offering with a contemplative introduction from Penelope Lively and stunning artwork from Lesley Barnes. From a wide range of writers including Carroll, Poe, Kipling and Milligan, this varied collection of poetry is bound to contain something for everyone. Contemporary classics such as ‘On the Ning Nang Nong‘ sit comfortably alongside Eliot’s ‘Jabberwocky‘ and Robert Louis Stevenson’s ‘Bed in Summer‘. With short poems, long poems, funny and serious, among these eighty-eight poems we are treated to a fleeting moment, an observation and even lavish storytelling. Lesley Barnes has once again worked her illustrative magic to pepper this iconic anthology with bold and alluring imagery. Lesley Barnes is renowned for her timeless artwork and her work is the perfect accompaniment to this rich and diverse selection of poems. With a limited but vivid palette and her use of clean lines against the negative space, Barnes’s illustrations pop with every turn of the page. We have to make a special mention to the glow-in-the-dark cover and slip case. Both front and back are adorned with striking animal images which come to life in the dark. This is most definitely one for the wish list and we will be gifting this on numerous occasions. Glow in the dark cover? Wow! Gorgeous!! I was intrigued, but glow in the dark!?!? Now I’m enthralled! This really sounds incredible. All kids definitely need more poetry love. Gotta love the nice presentation too.